And, yes, he’s wearing unmatched , different sized shoes he found in a garbage bin at the Olympics. This didn’t stop him from winning two gold medals. When people make lists of the greatest athletes of the 20th century, they are populated with the usual suspects: Michael Jordan, Babe Ruth, Muhammad Ali, Serena Williams, Wayne Gretzky, Jim Brown, Pele… but there is one name that should always make the list even though many people, even the biggest sports fans, may not recognize it, or if they do, they know little about the man- Jim Thorpe. The story of Jim Thorpe is one of determination, triumph, tragedy, racial prejudice, controversy, and extraordinary athletic achievement. Born approximately May 28, 1887 (the exact date has been disputed) in a small one-room cabin near the town of Prague, Oklahoma, Jim was the son of a farmer named Hiram and a Potawatomie Indian named Mary James, who was a descendant of the famed Native American warrior Black Hawk. Jim, or by his Native American name Wa-Tho-Huk meaning “Bright Path,” grew up on Native American land fishing, hunting, playing sports, and learning from tribal elders. He was actually born a twin, having a built-in best friend and brother to play with. Unfortunately, when Jim was only nine, his twin brother died from pneumonia. The stress of losing his brother caused Jim to act out and he was sent to an “Indian” boarding school in Lawrence, Kansas. A few years later, his mother would die while giving birth. Shortly thereafter, his father died as well. Spotting a high jump bar set at five feet nine inches, and despite wearing heavy overalls, he leaped and cleared the bar. While most of the boys and their coaches were not paying attention, one coach was. His name was Glen “Pop” Warner and he coached the football team. Jim soon became, with the help and coaching of Pop Warner, a multi-sport star in high school and later in college. He dominated in the high jump, lacrosse, baseball, football, and even ballroom dancing, winning the intercollegiate ballroom dancing championship. He was simply unstoppable with a football in his hands, leading his squad to an 18-15 upset over top-ranked Harvard in 1911. In 1912, Jim was literally all over the field, leading his football team to the NCAA championship. While playing running back, defensive back, placekicker, and punter, he scored a record 25 touchdowns that season. He began to get national attention, but his star really started rising with his performance in the 1912 Olympics. Jim Thorpe arrived in Stockholm for the V Olympiad having qualified in four different events; the decathlon, long jump, pentathlon, and the high jump. He won gold in the (now defunct event) pentathlon, winning four of the five events (long jump, discus throw, sprint, and wrestling). The only one he didn’t win was the javelin, which he’d never competed in before showing up at the Olympics. Nevertheless, he finished third in that one. That same day, he finished fourth and seventh in the individual events of long jump and high jump, respectively. And I should probably mention that shortly before it was his turn to compete, someone stole his shoes. He managed to find some more in a garbage bin. They were different sizes and didn’t fit perfectly, but he made it work by wearing extra socks on the one foot to make up for the ample room in the shoe. But what he is truly remembered for was his performance in the decathlon. He destroyed the competition setting a new record (8,412.955 points) that would stand for 15 years and is still to this day only 626.045 points behind the current world record holder for the event, Ashton Eaton, who set the record in 2012 at the United States Olympic Trials. 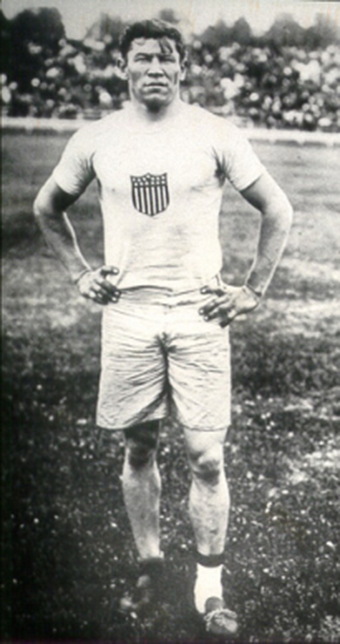 At the outset of the 1912 Olympics, local hero Hugo Weislander was the heavy favorite to win the decathlon. In the end, Weislander finished in second place with 7,724.495 points, 688.46 behind Thorpe. The bronze medalist that day, Charles Lomberg, finished just a hair under 1000 points behind Thorpe at 7,413.510. Legend has it that upon receiving the gold medal at the medal stand, King Gustav of Sweden told him “You, sir, are the greatest athlete in the world.” Jim, always modest, reportedly replied “Thanks, King.” Whether the story is true or not, this has led to the tradition of dubbing the Olympic decathlon winner the “World’s Greatest Athlete”. Shortly thereafter, he managed to break the Amateur Athletic Union’s All-Around Championship record by winning seven of the ten events in their competition and placing second in the three he didn’t win. The new record was 7,476 points, beating the old record (7,385) held by five time Olympic Gold Medal winner Martin Sheridan. Thorpe is the greatest athlete that ever lived. He has me beaten fifty ways. Even when I was in my prime, I could not do what he did today. Jim Thorpe as a hero wouldn’t last long. Several months after Thorpe’s gold medal wins in the Olympics, Worcester Telegram writer Roy Johnson uncovered that in 1909 and 1910, Thorpe had been paid to play minor league baseball. This violated the Olympics strict amateur rule. Despite this being a common practice for collegiate athletes of the day (most of whom used aliases to avoid being caught) and making a measly $15 a week to help pay bills, the Olympic committee stripped Thorpe of his gold medals. Just over a week after being declared no longer an amateur, Thorpe signed with John McGraw and the New York Giants to play pro baseball. Despite being the athlete he was, hitting a round ball with a round bat is a whole different beast than many athletic sports, and it certainly didn’t help that Thorpe hadn’t played in over two years, which contributed greatly to him struggling mightily in the early going. He became more of a sideshow than an actual contributing player. However, being the only athletic sport at the time one could actually make a good living playing, Thorpe chose to continue on with baseball until 1919, playing outfield for the Giants, Reds, and Braves, with his best season in the Majors being his last in 1919 where he batted .327 in 122 games with 318 at bats, 14 doubles, 6 triples, 2 home runs, and 14 stolen bases. In 1920, at the age of 33, he would go back to playing football, eventually becoming the first president of the American Football League, which later would evolve into the NFL. In the off-season in at least three of the years (1926-1928), he spent his time touring around playing professional basketball with the “World Famous Indians”. By 1928, at the age of 41, Jim Thorpe’s athletic career was over. As with many athletes when the attention, competition, and fame fade, Thorpe struggled. Alcohol, always part of Thorpe’s life, became a fixture. To make money, he took odd jobs under aliases like ditch digger, deckhand, and bouncer. He also used his famous face to earn roles as an extra in Hollywood Westerns as an Native American chief. By 1950, he was flat broke. But Jim Thorpe’s time in the spotlight wasn’t quite over. Despite his hardships, the Associated Press named Jim Thorpe the greatest athlete of the first half of the 20th century. In 1951, Burt Lancaster portrayed him in the 1951 movie “Jim Thorpe All-American.” The world hadn’t forgotten about Jim Thorpe after all. In March 1953, while at home in his trailer with his third wife, Patricia, in Lomita, California, Thorpe’s heart gave out on him and though he was briefly revived, he ultimately passed away. He died poor, but having had one of the most remarkable sports careers of any athlete in history, dominating several Summer Olympics track and field events and later playing professional baseball, football, and basketball. And, of course, he was also an intercollegiate ballroom dancing champion. In 1982, the International Olympic Committee finally agreed to right a wrong by awarding Thorpe’s family the two gold medals he rightfully earned. When Thorpe passed away, there was a rather odd controversy in regards to the burial of his body. His third wife, Patricia, refused to have his body buried in a traditional Native American ceremony, despite the insistence of Jim’s children. Instead, she wanted a Catholic service and the state of Oklahoma to build a memorial to her late husband. When the state balked, she literally took Thorpe’s body on a country-wide tour, looking for the right burial place that would give into her demands. Finally, the small eastern Pennsylvania towns of Mauch Chunk and East Mauch Chunk agreed to unify, accept the body, and change their name to “Jim Thorpe, Pennsylvania” in hopes that it would bring in tourism and the NFL Hall of Fame. The NFL Hall of Fame never ended up there (rather, in Canton, Ohio), but to this day Jim Thorpe is still buried in a small Pennsylvania town that bears his name, despite having no connection to him during his life. This is a great article, but left out the fact that Thorpe was inducted into the Pro Football Hall of Fame as a charter member, having been included in the first class that was inducted into the Hall in 1963. When vistors enter the Hall of Fame in Canton, a larger-than-life size statue of Thorpe greets them in the rotunda. Also, the Jim Thorpe Award is presented to the top defensive back in college football. Thorpe was Sauk, not Potawatomi. He was part of the Sac and Fox Nation in Oklahoma.